What do you think is better a chicken wrap ? Or a chicken sandwich ? Are you ready to sacrifice the bread and let the ingredients in your wrap take centre stage ? Well wraps are very easy to make especially when you can just buy the ready made wraps and just prepare the filling ! also wraps do fall under the light eating category ands that’s exactly what I Wanted. Here’s how I prepared my filling ! In a saucepan add the butter allow to melt ,followed by the ginger garlic and red masala spice , braise a little until you can smell the masalas and add chicken strips , mix this well and then add the rest of the dry spices , allow to cook until done . Take the wraps and bake them for 3 to 5 minutues or warm them up in a tava . 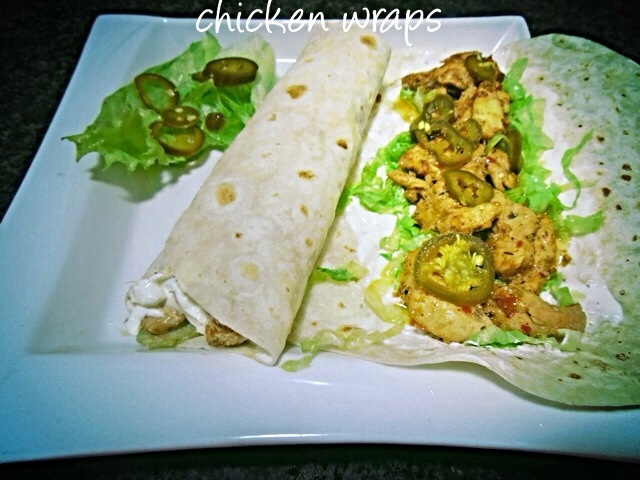 Spread as much sour cream on each wrap as desired ,add sweet chilli sauce and spread on sour cream add chopped lettuce , chicken strips and lastly the jalapeños . I would just add guacamole cos I love it with chicken n mex food.